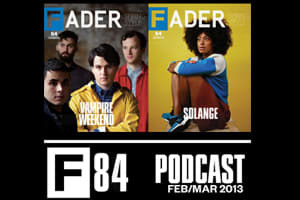 Maybe it's the crisp yellows and primary colors of this year's Spring Style issue, but The FADER #84 podcast seemed to be just asking to be left clean—no funky blends, pitch-downs or mashups, just fire track after fire track. Download the tracks as a mix below, featuring sharp songs by Solange, inc., Fear of Men, Laura Mvula, Rich Kidz and more, or buy songs individually on the MyMusicRX app. A percentage of each iTunes purchase made through MyMusicRX benefits the Children’s Cancer Association. Subscribe to our podcast on iTunes or via your favorite RSS reader to get them all. Rich Kidz f. Future and Chief Keef, "Ratchet"
Shy Glizzy, "Sad to Say"
Lonnie Holley, "Looking for All"
Christian aTunde Adjuah, "New New Orleans"
Gary Clark Jr., "Ain't Messin 'Round"
Shy Glizzy Inc Fear of Men Rich Kidz Gary Clark Jr. Laura Mvula lonnie holley nautic christian atunde adjuah Issue 84 Iamsu!